This workshop is designed for those who oversee any aspect of street-to-seat or volunteer ministry. You’ll discover what it takes to create a welcoming and empowering culture as well as how to find, empower and release volunteers throughout your ministry. 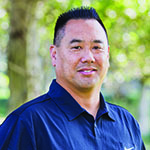 Executive Pastor of Operations, North Coast Church After joining the staff at North Coast Church in 1995, Dennis Choy created and developed the church’s Technical Production Department. North Coast Church, located in Vista, CA currently offers 54 worship services with over 13,000 attendees every weekend across five campuses. In his tenure Dennis has overseen our Communications, Graphics, Web, Creative Video, Social Media, Staging, and IT Department. In recent years he has served as the Vista Campus Pastor and our Executive Pastor of Operations. He has taught training classes at Infocomm, NAB, WFX, TFWM, NAMM and other conferences around the country and currently serves on the Board for the Church Technical Leaders Network. He focuses on “Real Church” understanding and practical tips to making your ministry better. He resides in Oceanside California with his wife Michelle and their three children. Your time together will include a campus tour, meeting with leaders from Sunday ministries, dinner and attending service. 8:30AM Meet at the Vista Campus (2405 N. Santa Fe Ave., Vista, Ca 92084) Breakfast will be served in the Warehouse.